HOUSTON -- On a night when Jake Arrieta did not have his best stuff, the Chicago Cubs' offense offered more than enough support. Jorge Soler and Addison Russell homered to lead Chicago to a 9-5 win over the Houston Astros on Sunday night, moving the Cubs closer to clinching the NL Central. Soler hit a solo home run as part of Chicago's four-run third, and Russell hit a two-run shot -- his 20th of the season -- in the fourth as the Cubs built a 9-0 lead. "We came out ready to play," Chicago manager Joe Maddon said. "We always do, but there was a little bit of juice about the whole game. Everybody was really raring to go and I thought we did a wonderful job of getting on top like we did." Chicago extended its lead in the NL Central to 16 games over St. Louis. "I think it all comes back to our goals and what we need to accomplish as a team," Russell said. "You come out with team wins like we did today, you saw the defense today and offense today and great pitching today as well. Keep that rolling, and we should be good." Houston fell 9 1/2 games behind Texas in the AL West and 3 1/2 back of Toronto and Baltimore in the wild-card race. Arrieta (17-6) allowed three runs on four hits with three strikeouts in 5 1/3 innings. He leads the NL in wins, and his 11 road victories is tops in the majors. Arrieta said he was feeling ill starting Saturday, and he knew he would have to conserve his energy as best as he could. "From the first pitch, I was pretty much running on empty today," Arrieta said. "It was just one of those things where I went out there and gave everything I had and then just really ran out of everything completely in the sixth to try to battle through it." Arrieta cruised through the first five innings, allowing a solo home run to Jose Altuve in the fourth to go with a walk and single but ran into trouble in the sixth. Alex Bregman hit an RBI double and came around to score on Arrieta's wild pitch to cut the lead to 9-3 in the sixth. The Astros then loaded the bases with one out, but Justin Grimm induced pop-ups by Evan Gattis and Colby Rasmus to end the threat. "Disappointing obviously to fall that far behind," Houston manager A.J. Hinch said. "We had a chance in the sixth, got a couple runs, could of had a bigger inning." Kris Bryant had an RBI double in the first, and David Ross had a sacrifice fly before Javier Baez scored on a wild pitch by Mike Fiers (10-7) in the second. Baez added an RBI single, and Albert Almora hit a two-run single as part of the third. 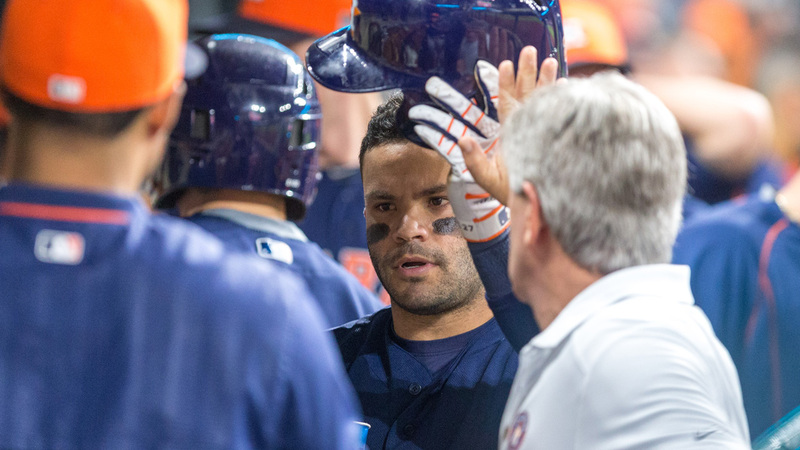 Yulieski Gurriel and Gattis hit back-to-back solo home runs in the ninth as the Astros lost for the fourth time in five games. Fiers was tagged for seven runs on seven hits in 2 1/3 innings. The right-hander had won two straight and allowed three runs or fewer in each of his previous four starts. Astros: SS Carlos Correa was back in the lineup after missing four games with inflammation in his left shoulder. Correa singled in the second and was replaced by pinch hitter A.J. Reed in the fourth. Almora ended the fifth with a diving catch coming in on Marwin Gonzalez's falling pop fly. Jake Marisnick then robbed Almora of a hit in the eighth, coming in and making a diving grab on Almora's pop fly. Russell became the second shortstop in Cubs history to have 20 home runs and 90 RBI joining Ernie Banks. His 90 RBI are the most by a Cubs shortstop since Banks' 117 RBI in 1960. Cubs: RHP Kyle Hendricks (14-7) starts the first game of a three-game series against the St. Louis Cardinals on Monday. Hendricks leads the majors with a 2.07 ERA. He has allowed three runs or fewer in 19 straight starts. Astros: RHP Doug Fister (12-11) starts the first of a three-game series against Texas on Monday. Fister will look to bounce back after allowing six runs in 4 1/3 innings in his last start at Cleveland on Wednesday.